Knitting Like Crazy: It's an addiction. With the deadline for my upcoming pattern book looming and some other things in the works, I don't have lots of time for mindless knitting. 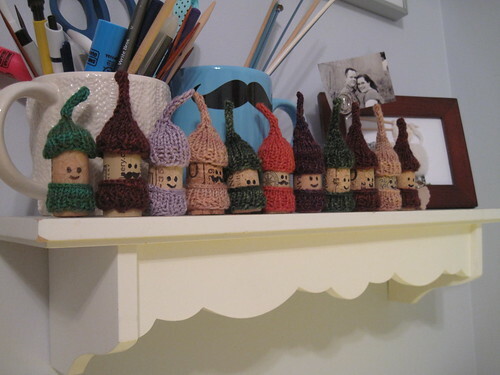 But when I do, I don't know why, all I want to do is turn wine corks into people. 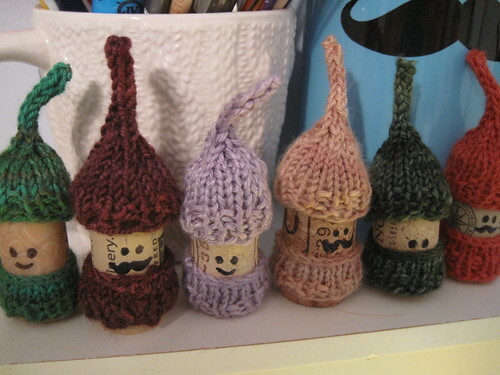 And now I am getting super crazy and making my cork people with mustaches! Seriously, this is turning into a sickness. And there are more wine corks around here. And I think people are going to start bringing me their wine corks. Someone help me. Btw, the pattern is Korknisse. I modified it a little adding a little i-cord to the top of the hat.